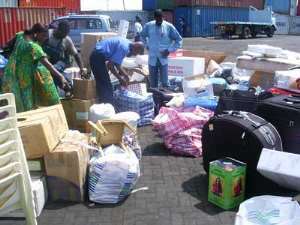 Accra, March 19, GNA- Professor Christopher Ameyaw-Akumfi, Minister of Ports, Harbours and Railways has said measures were being put in place to reduce the time for clearing goods from the ports. Prof. Ameyaw-Akumfi who gave the assurance at a buffet dinner in Accra in honour of the visiting trade delegation from Amsterdam, Netherlands said this would go a long way to reduce cost of goods on the Ghanaian market. The 17-member delegation from different companies of the Amsterdam Seaports arrived in Ghana on March 16 for a five-day visit. Led by Mr Mark van der Horst, Vice Mayor of the City of Amsterdam, the mission would concretise agreements between the Netherlands and Ghana which were entered into during a similar visit of a trade mission to Ghana in March last year. Prof Ameyaw-Akumfi said it was gratifying to note the consistent and impressive growth in transit, traffic through the Tema and Takoradi ports to the landlocked countries of Burkina Faso, Mali and Niger. This, he said, was a clear manifestation that the Ghana Ports and Harbours Authority (GPHA) would in the not too distant future, realise its vision of becoming a maritime hub, the most efficient one-stop service in the ECOWAS sub-region and Africa and indeed a reliable maritime gateway to the West African sub-region. The Ports, Harbours and Railways Minister pointed out that it was in pursuit of this vision that GPHA in conjunction with other stakeholders in the maritime industry, intended to implement a number of programmes to enhance the transit and trans-shipment potentials of the ports of Ghana. The measures, Prof Ameyaw-Akumfi said included the asphalting of the trunk road from the Port of Tema to the Northern border town of Paga into a first class access channel to Burkina Faso, and the development of an inland port at Boankra near Kumasi with facilities to consolidate cargoes meant for the northern sector and the landlocked neighbours. He was optimistic that besides satisfying government's desire to make the private sector the engine of economic growth, these measures and projects, would undoubtedly help GPHA to achieve its ultimate goal of reducing the cost of doing business at the ports and to facilitate the flow of trade through them. Prof Ameyaw-Akumfi praised GPHA for entering into cordial and fruitful relationship with Dutch Companies in the development of the nation's ports, and hoped the bonds of friendship between Ghana and Holland would be further cemented and strengthened. Mr Horst said the Amsterdam Seaports considered to be one of the fastest growing ports in Northwest Europe, has had an annual average growth of five per cent over the past 20 years. He said the Seaports provide the region with around 70,000 jobs, in addition to handling around 70 million tonnes of cargo annually. On cocoa, he said the Amsterdam port had been the most important import-port for the handling and storage of the commodity for many years now. Giving statistics, Mr Horst said between 16 and 20 per cent of the total world production of cocoa, was being handled in the ports of his country, adding, "our stevedores and warehousing companies have all the necessary qualities and experience to handle the cocoa efficiently." The delegation returns home on Saturday, March 20.